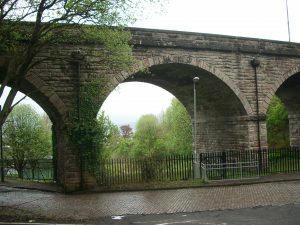 Viaduct for the former G & SWR line to Greenock, Princes Pier station. 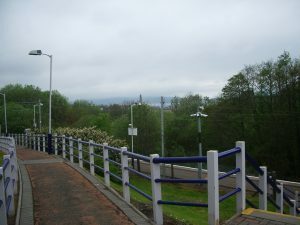 The station has fine views over the town of Greenock to the river. 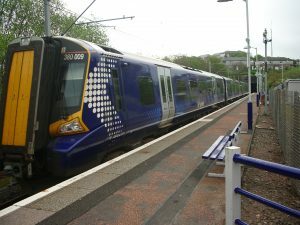 Whinhill is one of the newer stations on the Wemyss Bay line, opened in May 1990. It is now the first stop after Port Glasgow. 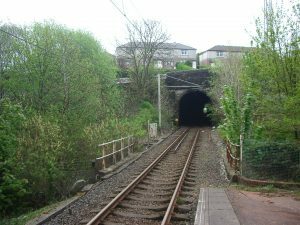 From Port Glasgow the Gourock line continues at low level, straight past the shipyards to Bogston Station, whilst the Wemyss Bay line climbs steeply to the left, through the 285 yards long Cartsburn Tunnel to Whinhill. Down below can be seen the large red brick Catholic church designed by Gillespie, Kidd and Coia (1951-55) and the handsome viaduct on the former Glasgow and South West Railway line to Greenock (Princes Pier). It is difficult to imagine today that this stretch of line passed through a very industrious part of Greenock, with flour and rice mills, sugar refineries, iron foundries, tannery, chemical works, potteries, sawmills and a brick and cement works, several with track connections to the line. High above is the Greenock Cut, the aqueduct designed by Robert Thom, which supplied water to the town below and powered many of these works. The station is single-platform, unmanned, and supplies a rail connection for people in the east end of Greenock which has been absent for over 30 years. It is well-placed for access to the National Cycle route. Its high situation provides splendid views over the town and river to Helensburgh, Cardross and the Argyllshire hills.